← We lived in a bus…! 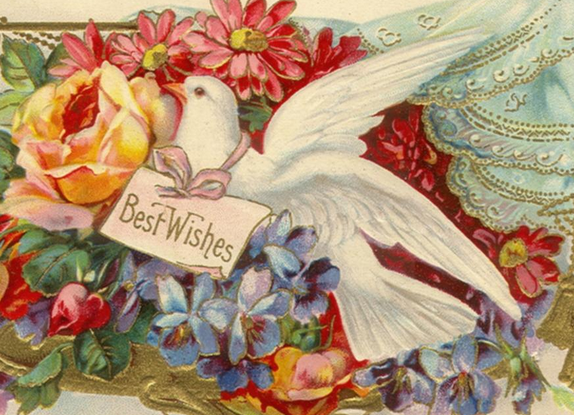 Wishes have always been at at the heart of fairy tales and story telling…they can be the seed that creates a whole new world or, more often, the first creak of discontent that brings on a landslide of disaster! 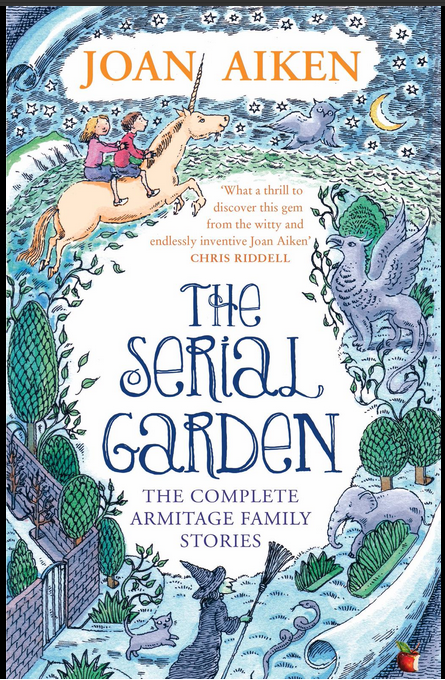 One of her most long lasting wish-gifts – given to Mrs Armitage, mother of Joan Aiken’s imaginary Armitage Family – was that she and her family, while living out their traditional ‘Happy Ever After’ in her stories would ‘never, never be bored’. This wish was to be prophetic also for Joan Aiken who was to go on writing their extraordinary stories throughout her life, with obvious enjoyment and relish. 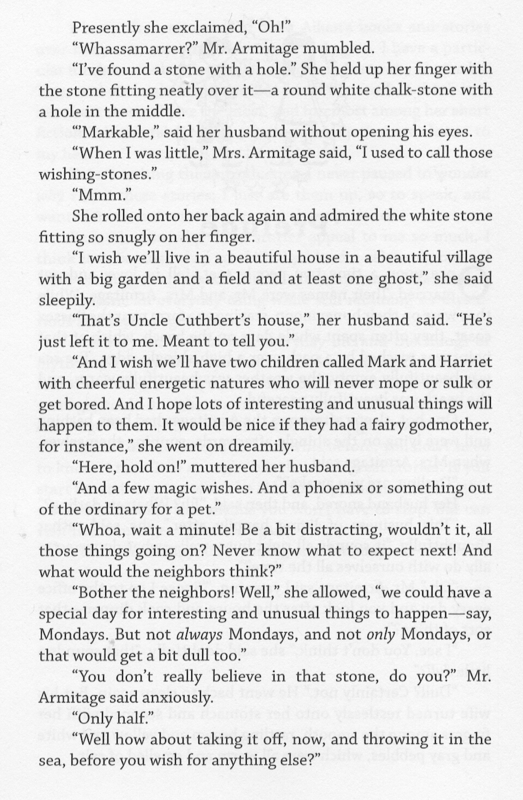 One of her own last wishes was to have all the Armitage family stories collected together from the many different story books where they had appeared over the years, and which was first published in the US, as The Serial Garden. This is the title of one especially memorable story, and also a very Aiken pun describing a garden that grows week by week, which is made from cut-outs found on a packet of breakfast cereal. This last story collection was intended for those readers who had written to her saying that the story was one that would possibly haunt them forever… The outcome of the original ‘Serial Garden’ story couldn’t be undone, but perhaps because of Joan Aiken’s original promise of a Happy Ever After, there would be a way to change it for the better? Luckily it was a gift that lasted all her life. Here is part of the Prelude Joan wrote to go with the Armitage collection, explaining perhaps to herself, or maybe to Mrs Armitage, why the family should be blessed with such good fortune – could it be because, in best Fairy Tale tradition, they knew when to stop wishing? For a Very Happy 82nd Birthday! This entry was tagged Charles Schlessiger Brandt & Hochman Literary Agents, Joan Aiken Fantasy Stories, The Complete Armitage Stories, The Serial Garden, Virago Children's Classics. Bookmark the permalink. Oh, that’s great news! I’ve got an unproofed US copy with some typos and American spellings which, though I loved reading it, has partly dissuaded me from a speedy re-read. Is there a publication date and will it be HB or pb? Waiting for final details, but just lovely they are celebrating already! Yes I need to revise for UK version – I have had comments about US incongruities in English village…but VERY EXCITING also coming is The Kingdom and the Cave, so long out of print, and NEXT YEAR a chance to do a new story collection – hooray! Thank you for ongoing cheerleading, you are a star! It’s a pleasure — every little bit helps, to coin a phrase. Also looking forward to the other two (re)issues! I have the US version, and I don’t remember any typos or incongruities, but that could just be my American eye and ear missing what’s obvious to English readers. Also, typos seem to be the norm in publishing these days — books that cost $25 or more can be chock full of the most obvious errors that even a computer should have caught.